The coat texture of your Goldendoodle puppy depends greatly on their generation such as F1, F1B, F2, F2B, and further multiple generations. Typically, the higher the portion of Poodle, the more curly and allergy friendly coat. Coat textures include curly, straight, and the most popular loose wavy. There are rare occasions of special colors and patterns like silver, wookie, wookie parti, and tricolored phantom. Our most popular look is the champagne colored Miami Goldendoodle with loose wavy to curly coat of short to medium length. While Goldendoodles shed minimally, they require some care including a brushing every few weeks and baths when necessary. 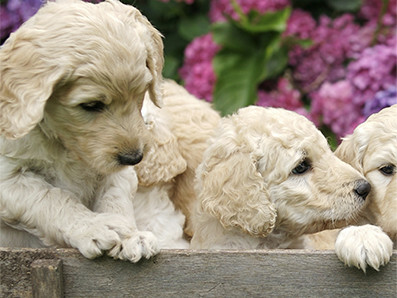 To the best of our ability we will endeavor to accurately predict adult size and coat type, but Goldendoodle puppies may grow larger or shed more than estimated. Contact our very knowledgeable staff at (786) 942-4288 for availability and potential coat colors in upcoming litters.